Augmented reality is in its infancy – experts believe virtual reality will be the big thing over the next few years, and augmented reality will take over after that. That’s not stopping Epson from banking on augmented reality now, however.The company unveiled its Moverio BT-300 AR headset back in February, and the device recently made its way to North America. Epson understands that AR isn’t likely to take off for a few years, but it still thinks it can offer some pretty great experiences in the meantime.We had the opportunity to try out the BT-300 headset at Augmented World Expo 2016, and jumped at the chance to jump into a whole new reality. Will Epson’s newest product soar or flop? It’s clear Epson has put a lot of effort into refining the headset since releasing the BT-200 back in 2014. The newer device is a lot less bulky, much thinner, and in general simply looks a lot better. No, it still doesn’t look like something you would wear all day every day, but it looks better than its predecessors. The BT-300 has two displays which merge into the glass portion of the glasses. In other words, with the displays off you won’t be able to tell that there are displays there at all – they’re invisible. 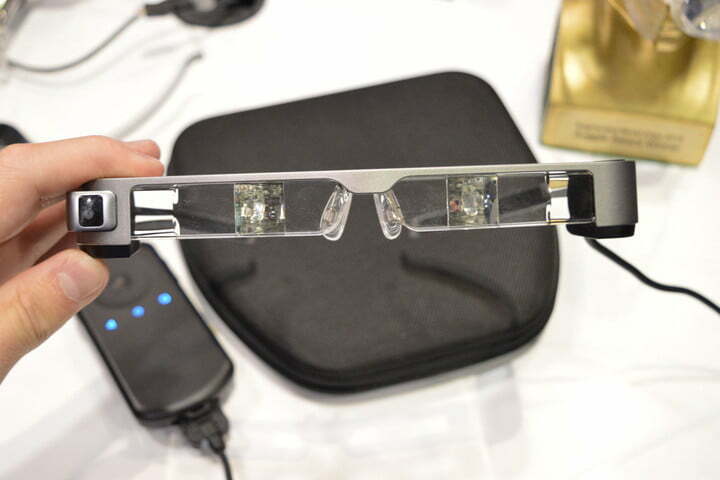 The product comes in two parts: There are the glasses themselves, of course, and a controller, which features a touchpad and Android buttons since the device runs Android 5.1. Because of the Android buttons, it’s easy to get used to the controller and there isn’t much of a learning curve, especially if you’re an Android smartphone user. AR is the natural progression away from our smartphone. 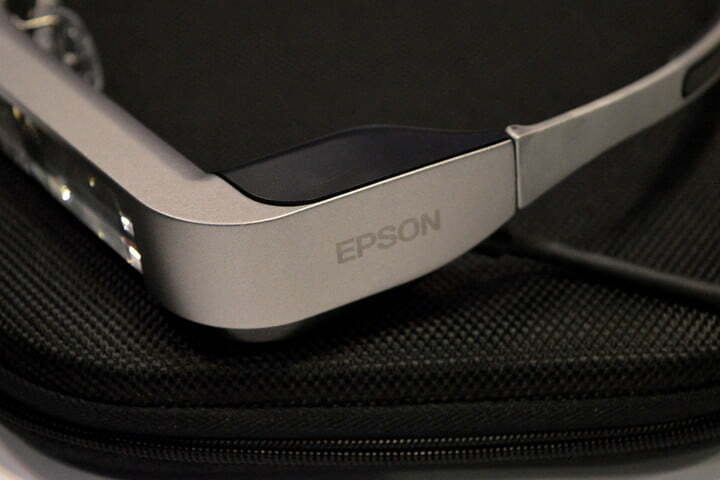 Epson touts the BT-300 as its lightest and sleekest AR glasses to date, and it shows. I was only able to wear them for a few minutes, but I could easily imagine wearing them for longer – they’re very light. The temples of the glasses aren’t too tight or bulky, and they fit snuggly on the head. Perhaps this would change after wearing the glasses for long periods of time, but for a short amount of time they work fine. While the glasses are lighter than other AR headsets, there’s still room for improvement. We’re excited to see AR glasses become even lighter and sleeker in the future; hopefully one day we’ll peer through AR glasses that are indistinguishable from normal eyeglasses. As mentioned, the display really fades into the glass on the glasses, and it’s a great-looking display too. While the BT-200 featured a 960 × 540 pixel display, the BT-300 kicks things up to 1,280 × 720 — that’s 720p — and it uses OLED technology, making images pop with far more color than the LCD screen on the BT-200 could. It’s important to note that while the 720p display does look quite good, there is room for improvement. When a display is this close to your eyes, it’s far easier to notice the pixels. We would have liked to see a display of at least 1080p, which obviously would take up more battery life. We’re guessing that’s what stopped Epson from including one here. Apart from the display, the BT-300 shows a clear progression from the BT-200. The device is powered by an Intel Atom X5 processor, and, as mentioned, runs Android 5.1. This means developers can create Android apps for the BT-300. In fact, many already work, as long as they can run in landscape mode. The BT-300 also features a 5MP camera and a battery said to last 6 hours on a single charge. I wasn’t able to put that battery life to the test, so we’ll have to wait and see how true that really is. Why would I want an AR headset? Let’s be clear – the BT-300 looks better than its predecessors, but it doesn’t look great. Sure, it’s sleek compared to other AR headsets on the market, but you’re probably not going to want to walk around the street wearing the BT-300. The BT-300 is a solid step forward for Epson’s AR headset line. Epson gets this. I had a chat with Eric Mizufuka, Product Manager of AR at Epson, who told me it would be weird for people to be walking around with their BT-300 all the time. Instead, the device is targeted at specific uses, whether that be business (imagine doctors doing surgery or mechanics fixing cars) or entertainment — movies, games, and so on. So why not just use VR for these things? Good question. Mizufuka suggested that AR is a natural progression away from our smartphone. Instead of looking down at our phones while we’re crossing the road, we’ll be able to look straight ahead, read notifications and emails, and still see where we’re going. Virtual reality would enmesh us entirely. He’s right – AR does have more potential, when seen through that lens. The BT-300 shows clear improvements in Epson’s AR headset line, and certainly left me excited for the future of augmented reality. The display is nice, despite needing a higher resolution, and the device overall is comfortable and light, despite still needing a big controller connected through a wire. AR is obviously still in its infancy, however. In a perfect world this gadget would be far lighter, with a higher resolution display and no wires involved. The BT-300 probably won’t bring AR into the mainstream, but it’s certainly a step in the right direction. The device will be available later this fall, and will cost between $700 and $800. Previous articleWhen it comes to the IoT, Germany is beating the U.S.